Glimpse of "Romantic Ooty Honeymoon Package"
Plan your special trip to Ooty with Holidays DNA. Book our Romantic Ooty Honeymoon Package and gift your partner with one of the best tours of a lifetime. Spend 3 days and 2 nights in the luxurious accommodation of Hotel United 21. Visit various sightseeing places in a taxi of your choice. Spend a few days of love and comfort with each other amid the enthralling scenic beauty of Ooty. Hotels & Rates for "Romantic Ooty Honeymoon Package"
Itinerary for Romantic Ooty Honeymoon "2 Nights / 3 Days"
What can be better than starting a new phase of your life with a perfect trip? Our Romantic Ooty Honeymoon Package presents an enduring way to spend your romantic holiday in Ooty where you and your partner are pampered in the best way possible. Enjoy the luxury and comfort of 3 days and 2 nights in United 21 hotel while go for sightseeing in a Taxi of your choices which is provided in the package itself. As the toll gates charges, parking fee and driver fees have already been included in the Romantic Ooty Honeymoon Package you need not worry about payments or any arrangements. We ensure that our customers enjoy the best of Ooty without any stress. There are many popular sightseeing places in Ooty that you can visit as per your preference and spend as much time as you would like to while the taxi waits to take you to another attraction. Some of the places that you can visit are Ooty Lake, Emerald Lake, Tiger Hills, Deer Park, Ooty Botanical Garden, Avalanche Valley, Mukurthi National Park, Deer Park, Wax World, Ooty tea factory, rose garden, Pykara Lake, Kalhatty waterfalls, Sims park, St. Stephen’s Church, Doddabetta Peak, Needle view hill point, Mudumalai National Park and Tribal Museum. Our Ooty honeymoon package also includes pickup and drop service from airport/railway station or bus stand to the hotel. The pickup and drop service is available for Coimbatore and Madurai. There is also the option of changing the pickup and drop location to other cities like Bangalore with just a minimum additional charge. Booking an Ooty tour package with Holidays DNA ensures a hassle free trip. On time reply, high standards of services, different accommodation choices, flexibility to pick and choose, and customization of tour packages are offered to every customer. Our travel experts are available for 24/7 to help you, guiding and suggesting you about the destination and if needed solving problem promptly. Our Ooty holiday packages also include pickup and drop services from Madurai and Coimbatore. If required we also offer pickup and drop from other places with a minimal charge. A popular hill station of India that has been aptly called as Queen of Hill stations, Ooty is a destination that must be visited by every travel enthusiast. 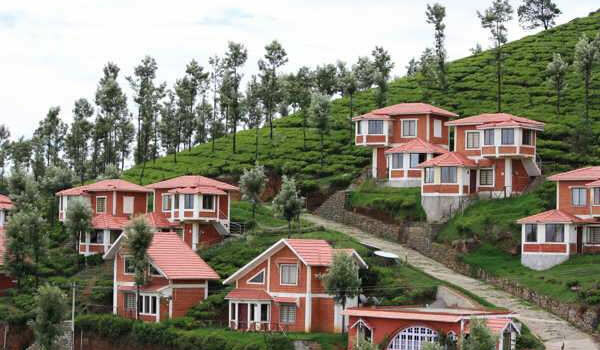 At an altitude of 2240 meters, the hill station of Ooty lies in the Nilgiri District of Tamil Nadu. Whether you are an adventure seeker or looking for a relaxed tour, Ooty is suitable for all kinds of holiday. Captivating sceneries, breathtaking waterfalls, tea gardens and lakes make a wide array of sightseeing choices as well. In addition to this, a wide array of activities ranging from trekking, horse riding to boating and angling make your Ooty trip all the most interesting.